Retaining walls are necessary to keep back soil and other materials. There are several factors that go into designing this kind of wall, and it is important to consider all of them because it will contribute to the strength of the structure. For example, you would have to consider the total height of the wall, the type of soil at the site, if there are surcharges applied, and what the drainage plan will be. If you are planning on building a very tall wall (over 4 feet) you should contact your town hall to find out if there are any limitations on how high you can build before needing engineered plans. 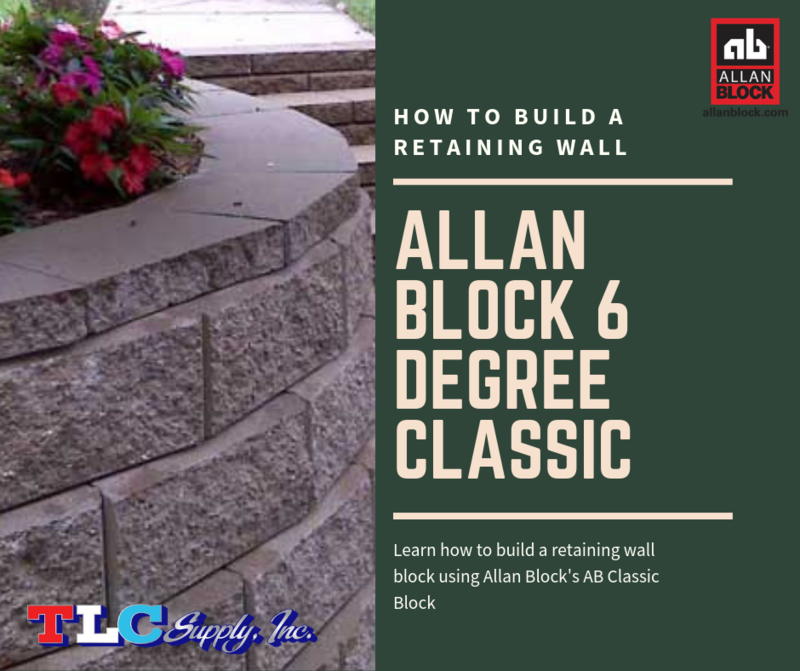 There are many different types of retaining wall blocks on the market but in this post we will be focusing on the Allan Block 6 Degree Classic Retaining Wall Block. 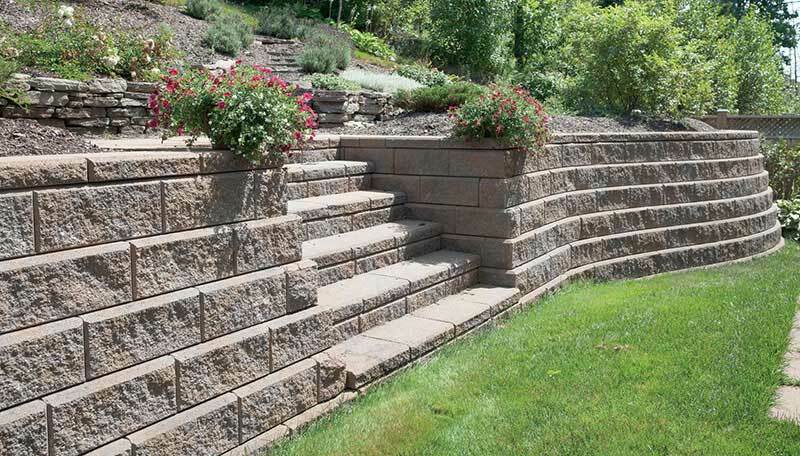 Allan Block is a leading provider of patented retaining wall systems. For over twenty five years Allan Block has been bringing innovative products to the hardscape and masonry community. Easy to Install – They are dry-stack blocks which means they can go together without the use of mortar or concrete footings. 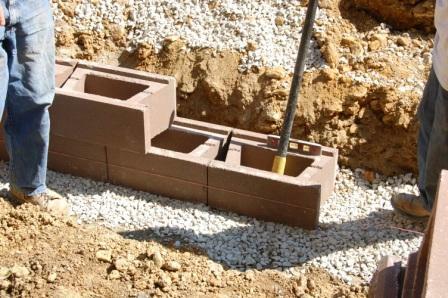 Easy to Handle – The hollow core feature makes them lighter than some other retaining wall blocks. Great Drainage – Hollow core also promotes good drainage behind the wall. Heavy Duty- The raised lip and notch lock each block in place and creates a natural setback. 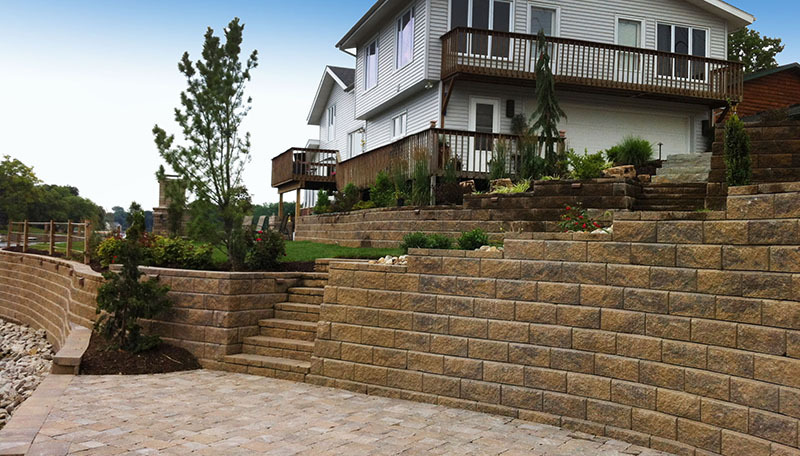 Versatile -The AB Collection is perfect for small residential projects to larger commercial retaining walls 6’ and over. For a simple Allan Block 6 Degree retaining wall in standard soil settings, building the retaining wall is straight forward. The total square footage will end up equaling the total number of Allan Block 6 Degree blocks necessary for your project. If you need any corners, take this into consideration as well. For Allan Block 6 Degree there are Left and Right Corners. TIP: On a Left corner, the one long side in the front and the short on the left are the only finished sides on the block. This same idea applies for the Right side. Corners are necessary when taking a 90 degree turn or when ending your wall nicely. Second: Excavate a trench. You will need to dig about a foot down and make sure to allow for space at the front of the wall and the back for drainage fill. This area will then be filled with ¾” crushed stone. ((Length of wall x Height of the wall) / 27) x 1.3 = Tons of ¾” crushed stone needed. Third: Compact it, and place down block of the same height along this leveled pad. Make sure that you back fill the rear of the wall with the same ¾” stone, this will allow for proper drainage and less chances of failure. If cavity blocks are used, fill the cores with the stone as well. Continue by laying the subsequent courses. The connections between the courses will depend on the type of block used. In this case the Allan Block 6 Degree blocks have a rear lip that will hook into the block unit below it. For extra support you can insert sections of universal geogrid. This will also add to the strength of the wall. 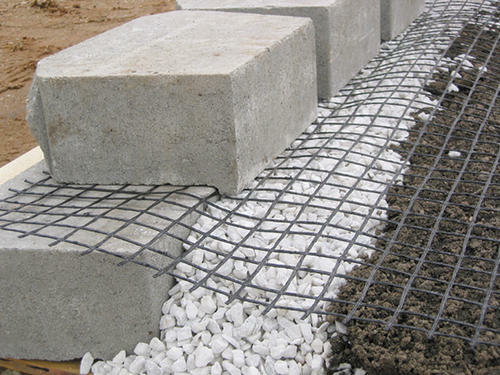 Geogrid is a fiber reinforcement that can be used in different applications to distribute a load across a large area. It holds the aggregate together, meaning that it is held tight into the earth. TIP: Never use heavy equipment less than 3 feet behind the blocks, and never drive directly over geogrid. 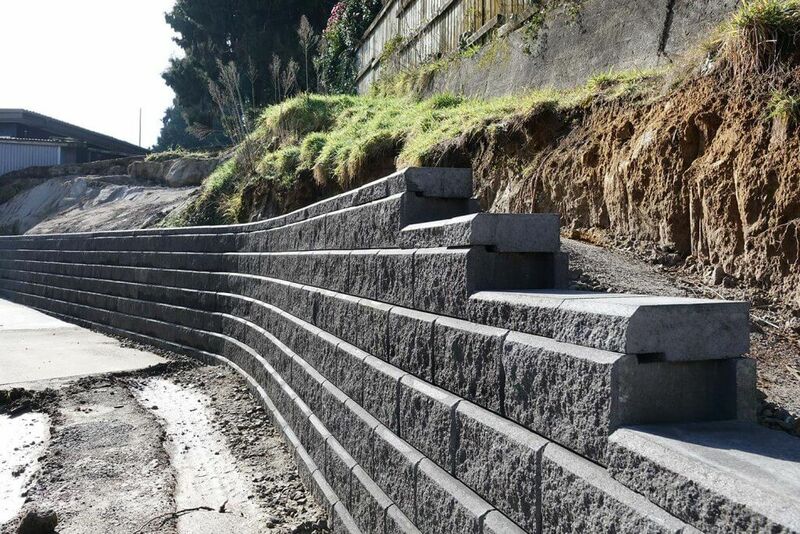 Final Step: Finish off your Allan Block 6 Degree retaining wall with Allan Block Cap. This will be the final layer on the wall and is typically applied with an adhesive. Once the wall is all set, you can refill the back of your wall with soil. If you get a decimal, round up to the nearest whole number. This will give you the total number of Allan block caps you need to finish your wall. 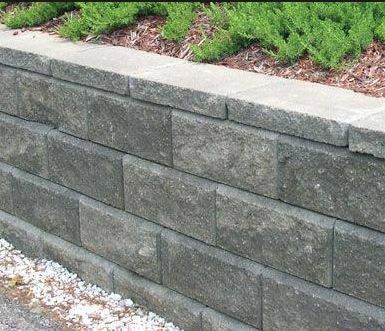 TLC Supply carries all the material you need for your retaining wall projects such as Allan Block 6 Degree Retaining Wall Blocks, Caps, and Corners, as well as crushed 3/4″ stone, geogrid, cap adhesive, and even waterproof sealers to protect your new investment. We are happy to answer any of your retaining wall project questions, just leave a comment below!